Igor Mezic, professor of mechanical engineering, displays a graph produced by his researchers. Less than an hour after emergency crews started scrambling to contain the Refugio Oil Spill, Dr. Igor Mezic already had a pretty good idea how and where the crude would spread throughout the Santa Barbara Channel. And less than four days after the May 19 spill, Mezic, a professor in UCSB’s Department of Mechanical Engineering, was fairly confident the fallout would trickle 100 miles south to Manhattan Beach. He was right. Yesterday, Los Angeles officials confirmed tarballs found there match the oily fingerprints of the Refugio disaster. “My specialty is trying to understand what a current will do with a spill,” Mezic explained this week. “I’ve developed a method that can track any material in or on the ocean. And when I say ‘I,’ I mean me and my team.” That team includes Dr. Sophie Loire and undergrad Patrick Clary. They also collaborated with Brian Emery and Professor Libe Washburn. On the day of the spill, Mezic and his researchers immediately started gathering data and plugging it into hypergraphs that — based on the team’s knowledge of regular tides and seasonal currents, as well as new measurements of velocity streams — predicted where the oil would travel. They forwarded their findings to NOAA and other federal responders involved in containment and cleanup. “It can make a huge difference in how you search and how you skim,” Mezic said of the results. The hypergraph below reveals the team’s predictions for the 48 hours following the spill. The blue and red streaks indicate where they expected the oil to go; the white and green areas show where they thought the oil would not be. “We said right away that the material would flow into the Channel,” Mezic said. Indeed, some of the oil hugged the shore and made landfall, but most of it, the computer model demonstrates, likely swirled in the Channel before heading southeast. Or it shot across 20-plus miles of ocean and ended up on the north shores of the Channel Islands. Some of it even went west. Mezic expressed concern that the bulk of the crude impacted whales, dolphins, and other marine wildlife that inhabit deep waters. Most of the booming and skimming ordered by the Coast Guard and EPA took place within a few hundred yards of the mainland’s coast in order to save popular beaches and, further down, hotels. Two days after the spill, Mezic suggested to UCSB earth science professor David Valentine that he check an area 8-11 miles offshore that the hypergraph predicted would be full of oil. Sure enough, Valentine arrived to find what he described as a seven-square-mile slick of thousands of “floating tar pancakes.” There’s some speculation that those tar pancakes were what floated to Manhattan Beach. Mezic said he was in consistent contact with NOAA in the days after the spill, and that he was consulted when flyovers revealed a strangely concentrated sheen eddying east of Refugio State Beach. 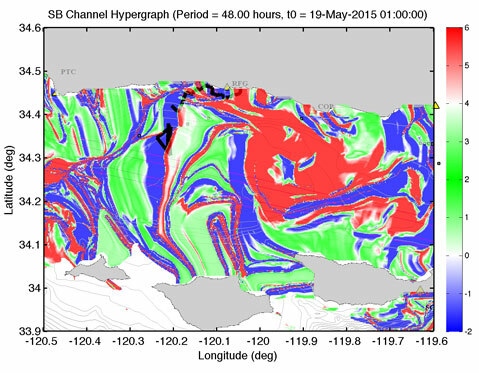 An updated hypergraph showed winds and currents were pushing it there. Though Mezic said NOAA seemed to value his input, he can’t say if or how his team’s research was used to inform response efforts. At this point, the crude has dispersed so much in the Channel that mapping models are no longer helpful. • Geographer and marine scientist Libe Washburn monitored real-time surface currents and plume trajectory via high-frequency radar. • Project scientist Leonal Romero and David Siegel, professor of geography and director of UCSB’s Earth Research Institute, are examining land-ocean interactions in the Santa Barbara Channel to determine how material from coastal streams makes its way into the ocean. • Geography professor Dar Roberts made use of NASA’s Airborne Visible/Infrared Imaging Spectrometer New Generation instrument for remote sensing. • Marko Peljhan, director of the Sytemics lab in UCSB’s Media Arts and Technology Program, helped activate the International Charter on Space and Major Disasters, which provides for acquisition and transmission of space satellite data to relief organizations. • Carol Blanchette, an associate research biologist with the Marine Science Institute (MSI), is surveying rocky shoreline sites during low tides, documenting species and the extent of the oiling. • Robert Miller, an MSI assistant research scientist, has been looking at the ecological effects in kelp forests and other benthic settings. 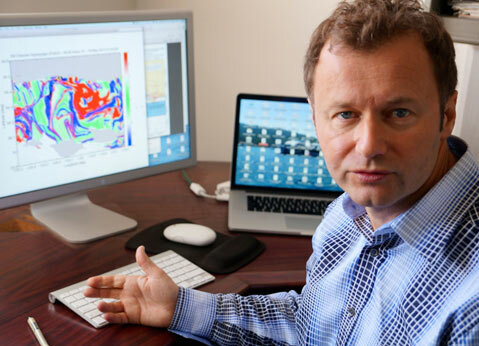 • Uta Passow, a research oceanographer at MSI, has been studying the potential for marine snow formation and sinking. • Craig Carlson, a professor of microbial oceanography in the Department of Ecology, Evolution and Marine Biology, is studying the interaction of microbial communities and carbon processing in contaminated waters. • Alison Butler, a professor in the Department of Chemistry and Biochemistry, is looking at iron acquisition by bacteria from the contaminated waters and, potentially, at bacterial transcription patterns. • Marine Science Institute researcher Jenny Dugan and her group are surveying sandy beaches to determine the effects of the oil on beach animals and ecosystem function.